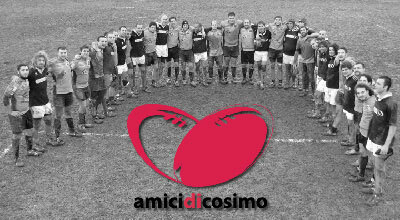 Amici di Cosimo born after the dramatic spinal injury of Cosimo Alessandro during a rugby match. This injury forced him on a wheelchair and totally changed his life, but has been the driving force for a series of activities that brought our association to be in an outstanding position on spreading the word about safety in rugby world. The number of people showing support to Amici di Cosimo has been constantly increasing and we feel like strongly thanking everybody, without you nothing would have been possible! Enter the site and discover our charity activities and the test matches we organized with the Firefighters National Rugby Team, the Noceto Rugby and the Sapeurs Pompiers Isère Rugby Team. Discover how hundreds of teams, associations and normal people contribute to sustain Cosimo after his dramatic rugby injury. Enter the site to help us, to send Cosimo a message or just to peer, to get to know us and to talk about us. Every word, every contact and every player interested in rugby safety is a small piece added toward a better world for Cosimo and for all of us. Help us to keep working, to turn the cooperation with Italian Rugby Federation and New Zealand Rugby Union, that already lead to several meetings about safety in rugby, into a real SicuRugby system to help the injury decreasement in italian rugby.